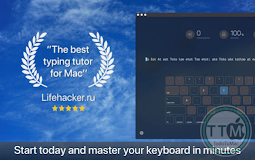 KeyKey is a manageable typing tutor that learns your level as you practice. All you do is commit to a 15-minute session every day. The app takes care of the rest. There are no lessons, no tests, and no strange minigames. Instead, you get a beautiful minimalist interface and a boost to your WPM. 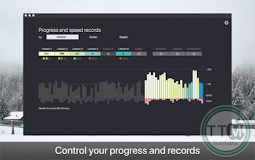 The app records your errors and adapts the practice wordlist as you go, giving you extra practice for the letter combinations that trip you up. 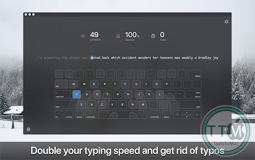 The app helps users who want to improve their typing on QWERT, DVORAK, COLEMAK, AZERTY and QWERTZ layouts. Lessons appear as a continuous line of words to type. The more errors you make, the easier the words get; as you improve, the words become more complex. You can also see your errors, completed words, and elapsed time as you type. A big part of typing faster is using the proper finger placement. The app makes this easy with its built-in virtual keyboard. This keyboard models proper hand placement in real time and shows you which finger to use for optimally typing each letter. The more you learn to adapt your hand motions, the easier typing will be. To generate both its English and Cyrillic practice, the app digested over 3,000 books and articles. The wordlists for the app’s lessons are derived from these materials, and ranked from common to uncommon. Whether you’re trying to improve speed in your native language or trying to type faster in a new one, you’ll get typing practice with the phrases people actually use. With a few weeks of daily practice, you should be able to type around 60 words a minute in your chosen keyboard format. But the fun doesn’t stop there. The app includes an “expert mode” that can push your speeds even higher with even more complicated and challenging words and phrases. There’s no point in typing quickly if you’re constantly making mistakes. 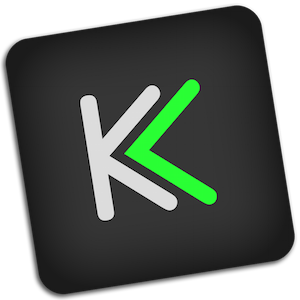 WIth KeyKey, you can type confidently and precisely. That’s a skill all of us could improve on. 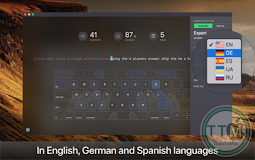 In this version we’ve added lessons and localization in Italian as well as two virtual keyboard prompts control options and geeky layouts for English and German. There are two keyboard layouts in Italian: “Italian” and “Italian Typewriter”.